The 2016 vintage from Domaine de la Romanée-Conti has been released and although the results ended up surpassing expectations after a difficult year, there are some noticeable absences from the usual line up. The 2016 vintage in Burgundy was famously difficult and wrought havoc with yields as frost, hail and mildew in the first half of the year laid waste to the potential crop and then a heatwave in the second half concentrated the juice, lowering the yield still further (although this ultimately probably saved the vintage as well allowing proper ripening to take place). Speaking to the drinks business at the offices of the domaine’s UK distributor, Corney & Barrow, co-owner Aubert de Villaine explained that if 2015 had been the “perfect vintage”, 2016 had been “the contrary”. “When we picked we thought we were going to make a ‘vin difficile’, not a great wine,” he admitted though they still hoped to make something drinkable after the hot summer. Yet as the fruit rolled in and the first juice was run off with excellent colour and fermentations began, it was, he continued, a “divine surprise”. The second half of the season with its vastly improved conditions really had saved an otherwise disastrous-seeming situation. “It goes to show it’s the second part that really makes the vintage,” said de Villaine. So a difficult year capped off by an “extraordinary achievement” with wines that are “very intense and great,” he thinks. But the scars of the vintage are visible on the domaine’s stable of wines. In some crus it was far from a disaster in terms of yields, Romanée-Conti and La Tâche produced slightly more than they did in 2015, while Richebourg, Corton and Romanée-St-Vivant were roughly the same. The big losses came in Montrachet, Echézeaux and Grands Echézeaux. In the latter two the yields crashed from 25hl/ha and 30hl/ha respectively in 2015 to 6hl/ha and 7hl/ha in 2016. As a result, the domaine has decided to bottle what was salavaged in magnums and de Villaine told db that these would not be offered alongside the other 2016s but would be kept back for “some years” and released at a later date. In the rather cruel way of frost or hail damage, although in this instance it conspired to rid Echézeaux of 90% of its crop, the resulting wine was apparently extremely good, “very intense”. 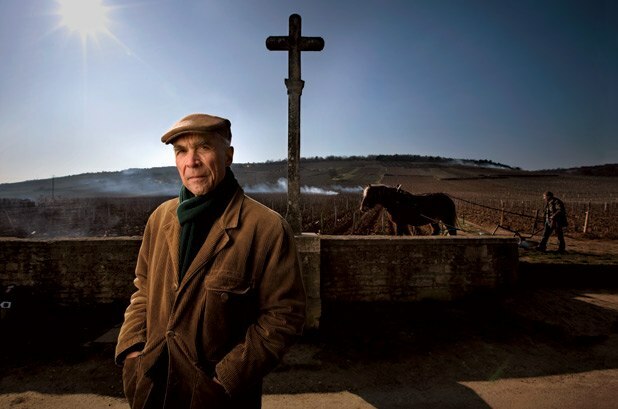 Montrachet was so badly hit by the frost that the domaine hasn’t said how much it produced. Nonetheless, it’s well known that de Villaine in a ‘campaign of solidarity’, teamed up with six other domaines* with Montrachet holdings to pool what wine they had into a joint cuvée. The result was two barrels-worth of wine, just 500 bottles which will be split between the domaines to use as they see fit. De Villaine told db that DRC’s share was going to go to charity at some point but when and to what cause was yet to be decided because the wines were only just bottled. Speaking of the losses more generally, de Villaine finished by saying that the crop had rebounded in 2017 in those crus hit worst by the frosts with the average yield for the estate rising from 25hl/ha in 2016 to 32hl/ha in 2017. So next year there will be normal allocations again of everything – in as far as allocations of DRC are ever ‘normal’.